Thank you so much for all of your kitchen remodel suggestions. We had an appointment with the designers yesterday and low and behold, we have little-to-no choice in the matter – our remodel is starting much sooner than expected. As in, demolition is slated to begin in FOUR weeks. For anyone keeping tabs, my due date is 4 weeks from today. The good news is the timeline they’ve proposed is more than reasonable. I mean, there’s very little about a kitchen remodel that isn’t a huge inconvenience, but for every reason in the book (and blog! ), the less time my kitchen is out of commission, the better. More importantly, the less time I’m trapped in my home with banging and pounding…and a newborn, the better. Obviously. The outline they proposed included about 2 weeks of demolition – we’ve been told to expect lots of noise and mess and a completely out-of-use kitchen. The following 2 weeks, we’ll have cabinets installed, as well as a fridge, oven, and microwave…but will not have counter tops (other than plywood make-shift counter tops), a dishwasher, or a range. We’ll have water reconnected for use in the kitchen during this time, as well. The last 1-2 weeks (likely 2, let’s be honest) will be spent installing counter tops, lighting, etc. There’s more going on during that time, but I can’t remember it all. But, for all intents and purposes, the kitchen will be pretty much un-usable. I’m trying to get pumped about the kitchen without fretting over the inconvenience and timing with the baby. I’m also trying to prepare in every way possible for what this time will look like. We’ve received some great advice, like using the electric griddle and crock pot. And paper ware and plastic ware, of course. 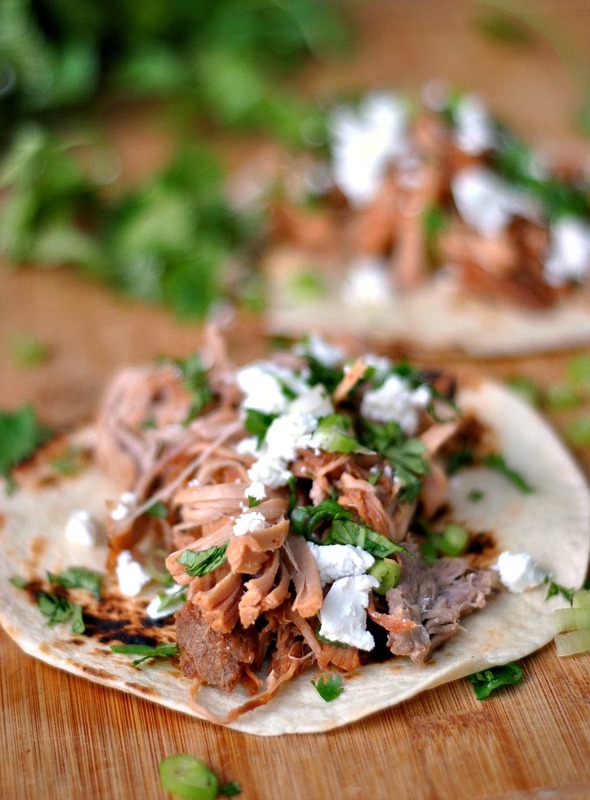 Speaking of crock pot, how about these tacos? Everything about them screamed “make me! !” but mostly the pineapple + goat cheese combination. I was totally intrigued. 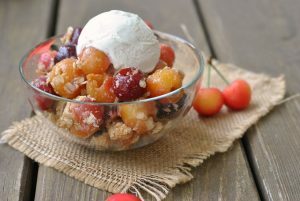 The delicious, bold flavors are the perfect blend of sweet and savory with a quick prep and simple ingredients. They’re certainly something I could make come a month from now when I have very little available to me in my kitchen! Plus, the leftovers are delicious, too! Place the pork tenderloin in a crock pot. In a medium-sized bowl, combine the juice from the canned pineapple, along with the soy sauce, apricot preserves, garlic powder, and black pepper; whisk to combine and pour over the pork. Add all but ¾ cup of the pineapple chunks (reserve the rest, storing in fridge). Cook on low for 8-12 hours. 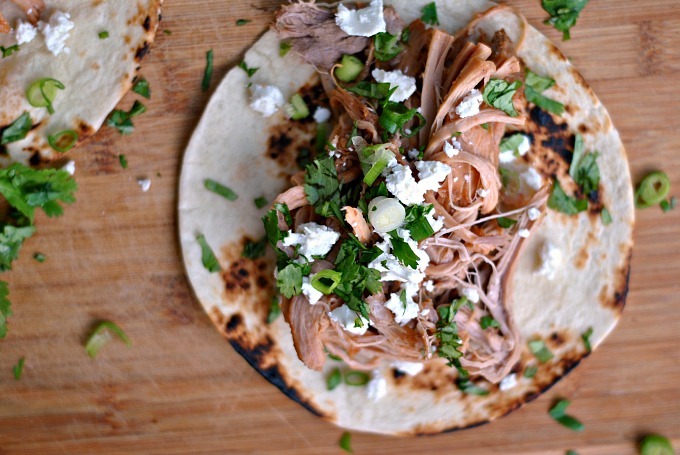 Remove pork to a cutting board and shred between two forks. Discard all liquid from the crock pot and return pork to the crock pot. Cover and continue cooking. Meanwhile, combine all of the ingredients for the BBQ sauce in a blender or food processor and pulse until smooth. 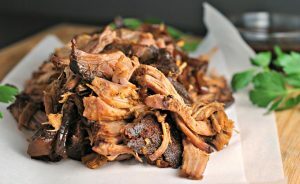 Pour over the pork and gently mix to coat pork, or alternately, serve on the side or drizzled over the top of the pork. 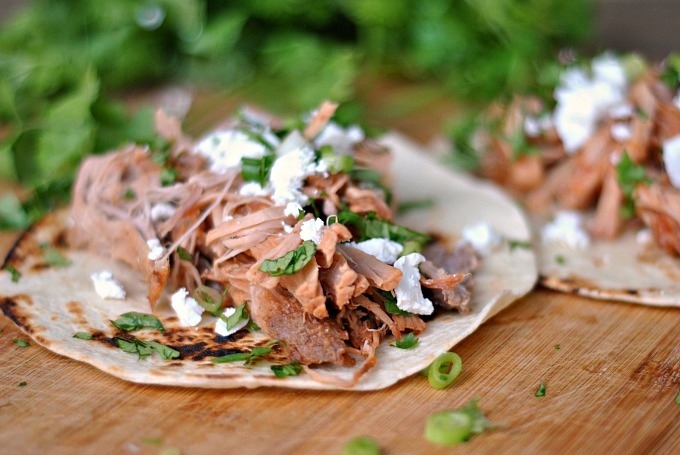 Serve pork in tortillas topped with cilantro, goat cheese, and green onions. 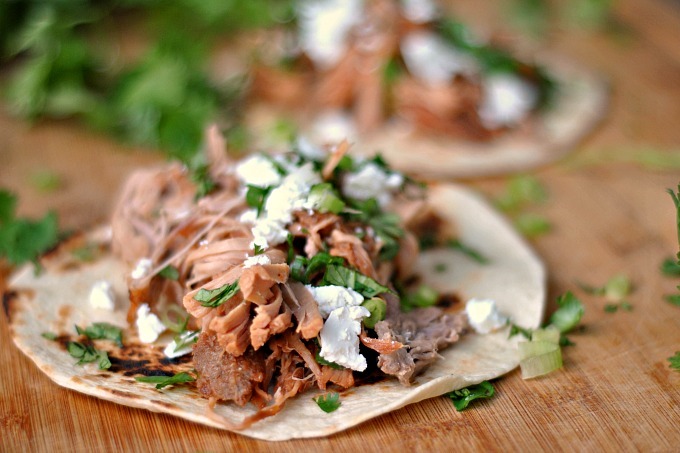 I can’t resist a taco and love the pulled pork and addition of goat cheese. Good luck with your remodel. Be prepared for it to take longer than you think it will and cost more than you thought it would. Everyone told me that last year when I did mine and I didn’t believe them. 🙂 I thought I had things budgeted down to the penny, but unexpected electrical stuff came up as well as a few other things. You are lucky to have a crew, that will make it go faster. My husband did ours all on his own which saved tons of $$, but stretched the timing out over the whole summer as he was a weekend warrior. He would pull the kitchen apart on weekends and put it back together on Sunday nights so I could cook during the week. We were able to prep and wash dishes in our bar area, but I greatly relied on the grill and crockpot too. I made these today and they are soooo good!!!!! I will make it again.